Architect David Child's final design for the Freedom Tower on the World Trade Center site may be bringing a long, sad saga limping to a close. In an act of truly stupendous chutzpah, architect David Childs of Skidmore, Owings and Merrill chose AIA New York's Design Awards, whose stated purpose is to increase awareness of outstanding architecture, as the forum in which to present what he claims are the final drawings for the 1,368-foot-tall skyscraper to be built on the site of the World Trade Center. It's come down to blowing smoke and using mirrors - in this case, a facade of glass prisms. Those prisms replace the metal originally envisioned as the cladding for the lower floors. With a straight face, Childs claimed that the prisms will somehow disguise the fact that the building's base is an oppressive, 187-foot-high, windowless concrete bunker. It glistens and sparkles, enthused the AIA New York president, like a cat mesmerized by a piece of string. It's the latest chapter in the tale of a project that, after 9-11, began in highest idealism, and quickly deflated into a seemingly endless parade of blunders and venalities that has brought out the worst in everyone who came in contact with it. There's Governor George Pataki, whose vacillating demeanor made him an enabler of Larry Silverstein, a small-minded developer who makes Donald Trump look like an enlightened visionary. There's Daniel Libeskind, the architect so entranced by his newfound superstar celebrity that he became a sitting duck for the wolves of New York power politics - one of them, of course, being David Childs himself, who, with Silverstein's blessing, used the openness and daring of Libeskind's original design as a club to beat it to death with. Add in the New York Police Department, which demanded that the concrete bunker be added to Freedom Tower's design, never mind that Manhattan offers over 250 towers of 40 stories or more with no bunkers at the base to protect them, or that, right next door, the transit hub being designed by Santiago Calatrava, to be used by 250,000 people daily, is as open and vulnerable as the Freedom Tower is closed and fortressed. Timothy McVeigh didn't have to drive into the Murrah Building to bring it down; he simply parked his truck. What's going on at the World Trade Center isn't about safety. It's about fear: irrational, debilitating and, ultimately, self-defeating. So what was supposed to be a beacon for our strength and freedom has become a lunkheaded stack of stupefying, pointless mediocrity. The official design phase is over, the New York Times quoted Childs as saying, which somehow reminds me of Vermont Senator George Aiken's famous advice during the quagmire of Vietnam. Declare victory and get out, he said. 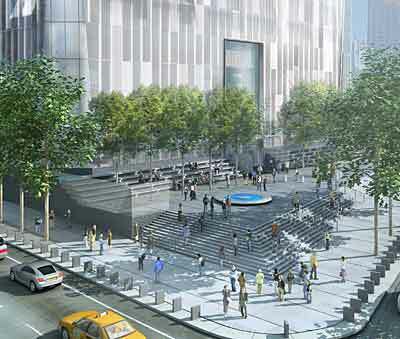 For Freedom Tower, there's no longer any point in getting angry. Allow yourself a long wistful, sigh. Remember and learn. Concede defeat and move on to the next battle.